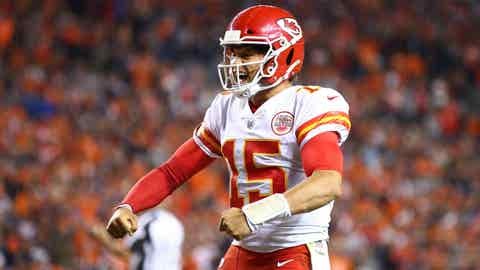 Patrick Mahomes rallied the unbeaten Kansas City Chiefs back from a 10-point deficit in the fourth quarter. DENVER — A suddenly ambidextrous Patrick Mahomes rallied the unbeaten Kansas City Chiefs back from a 10-point deficit in the fourth quarter for a 27-23 win over the Denver Broncos on Monday night. Thanks in part to a left-handed throw from the right-handed Mahomes in the final minutes as he was about to get sacked on third-and-5 at midfield, the Chiefs (4-0) took a two-game lead over the Broncos (2-2) in the AFC West with their sixth straight win over their rivals. On that last drive, Mahomes was getting dragged down by Von Miller when he shifted the ball to his left hand and threw it to Tyreek Hill for a first down. The play should never have counted, however, because the play clock expired before the snap. But referee Craig Wrolstad’s crew missed it. “The clock was zero, but that’s not my job,” said Broncos coach Vance Joseph, adding that he raised the issue with an official who insisted the Chiefs had gotten the play off in time. Phillip Lindsay ran 16 times for 69 yards and a score and Royce Freeman ran eight times for 67 yards and a touchdown. Freeman took a toss from Keenum and slipped seven tackles on his way to a 14-yard touchdown in which he dragged linebacker Anthony Hitchens across the goal line to tie it at 10. The Broncos led 13-10 at halftime.